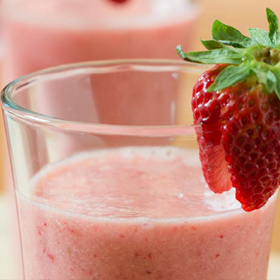 In a blender, combine all the ingredients except 1 1/2 cups of the ice cubes, and puree until smooth. Add the remaining ice; blend until smooth. Pour into tall glasses, and garnish with whole strawberries. Each serving provides an excellent source of vitamin C.
Serving size: 1/3 of recipe. Amount per serving: 150 calories, .5g total fat (0g saturated fat), 0mg cholesterol, 35g carbohydrates, 4g protein, 4g dietary fiber, 40mg sodium.